Honda's Trail Bikes were a part of many childhoods. So were scale models. 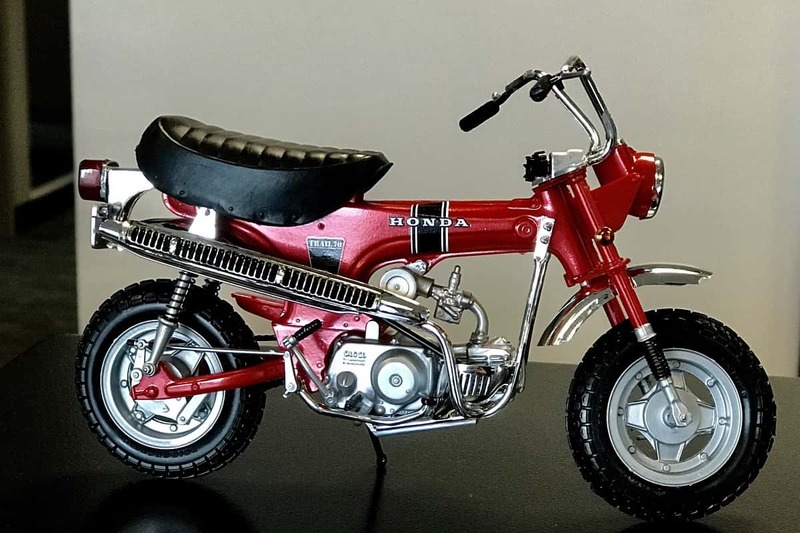 If you had a Honda Trail 70 when you were a kid you remember just how fantastic these minibikes were. They were rugged, reliable, could go anywhere and were a blast to drive. Honda built them for children and teens and wisely limited their performance to be just right for adventure without making them so fast parents would steer kids clear. Along with minibikes, building scale models was a big part of many kids' childhoods. The Tester and other branded kits were inexpensive fun that taught patience and hand-eye coordination to a generation. Putting these kits together isn't like Lego kits. You need tools, glue, a sharp eye, and painting skills for the result to look like the image on the box. The model shown in our images was built by Chris Naughton. As the old photo of Chris above shows, he was the lucky owner of a Honda Trail 70 when he was a youngster. We know Chris from his job as an Acura employee. Chris has supported Torque News writers for years behind the scenes as a team member for Honda and Acura. He helps us with test vehicles, press information, and the media files we need to do our jobs. We spoke to Chris about his cool model. Here's what he told us. TN - Where did you get this model? How did it come together? CN - After some searching, I found this one on Amazon for under $30. I used old images of the Trail Bike I had to find the exact one. The model came with a variety of logos and decals covering various model years. TN - How Did the build go? Was it easy to do or difficult? CN - It took me over a month working regularly for a few minutes to an hour or so per day. The parts are so tiny I tell people that it was like gluing the two tips of two pins together in many places. Many of the parts are only about 1/6th of an inch in size. Tiny. But each part is critical to the overall outcome. I would use Ikea furniture as a metric. It was like putting together ten Ikea dressers! TN - Do you have any other models? CN - Yes, at my desk I have a scale Acura NSX model I built and also a model of the very first car I owned, a Chevy Monza Spider. TN - What was the most satisfying part of the project? CN - I'd have to say adding the very last decal. The kit was fun to build, but so difficult I considered quitting more than once. However, now that it's built and it is so exact, I'm very satisfied with the result. Our thanks to Chris Naughton for sharing this story and these images with us.